Outside, heavy rain falls on Zanzibar. Let the record show that I made it here only because I managed to perform the first successful MasterCard transation in the history of Kigali International Airport. (At long last my retail experience comes in handy!) And soon I depart on a train that will take 40 to 48 hours - opinions vary - to carry me from Dar es Salaam to somewhere deep in Zambia. If all goes according to plan. That being, this being Africa, quite unlikely. I sorta wanna go back to the Congo, but I think I need a better reason than "sorta wanna". Also it's bloody expensive. Stone Town, the capital of Zanzibar, is an intoxicating, captivating mix of colonial-era compound and Arab medina. Walking through it is like playing Zork: "you are in a maze of narrow, twisty alleyways, all alike." Old Stone Town's cobblestoned walkways are too narrow for cars. They are clogged instead by passersby, cyclists, motorcyclists, mopedists; tall Swahili women in gloriously coloured or plain black robes and headscarves, and men in Islamic skullcaps; malformed beggars; vendors selling vegetables, paintings, carvings, trinkets, Cokes, or books in most European languages; skittering cats and giggling children following a rolling tire rim to wherever it leads. They pass mosques, travel agents, Internet cafes, jewellery stores, hotels, convenience kiosks, homes, and mysterious buildings with extraordinarily elaborate doorways, wood carved into fantastically detailed and delicate patterns, bristling with brass knobs and protrusions. Your doorway, in Zanzibar, is an indication of your social status. It's impossible to maintain one's sense of direction. The alleyways are walled by buildings sufficiently high that the sun remains invisible for all but a fraction of the day, and even then, the tin awnings and incredible spaghetti tangle of electrical cables block much of its force. Streets zig, zag, bend and twist, widen and narrow, all so subtly that you can turn fully around without knowing it. Many buildings have concrete benches built into their side; they and tables at little squares and intersections are often full of men loudly arguing politics. There's an election in ten days, and the mood is tense. Zanzibar is extremely touristy. After the previous month, this is actually kind of relaxing. Ramadan doesn't interfere much - my hostel, a converted slave market in which I have a vast and decaying room (with vast and decaying balcony) for US$25, serves breakfast after dawn, and decent Chinese and Indian restaurants are open for lunch, as are various touristy places. On the beaches of Nungwi, further north, you'd be hard-pressed to know it's Ramadan at all. Nungwi is one of those ridiculously gorgeous tropical backpacker paradises to which one could easily retire for a month. A row of lodges runs along a shore thick with baobab trees and coconut palms. Each lodge offers, in back, a row of bungalows along with maybe a Net cafe, little store, coffee shop (with Tim Horton's coffee! ), travel agent or dive shop; and in front, a large restaurant-bar with thatched roofs and wooden deck, perch on a massive coral-rock outcrop. At low tide, these overhanging outcrops jut out over a wide expanse of cool white beach; at high tide, you can dive straight from the bar into the Indian Ocean. Daily minibuses take you to and from Stone Town for five bucks. You can dive, snorkel, learn to sail a dhow, play volleyball on the beach, visit the gargantuan nearby Italian1 five-star resort, go on spice or monkey or dolphins tours, or, a highly favoured option, do nothing at all. The ocean sunsets are fantastic. The full moon, two nights ago, was bright as a searchlight, you could literally read a newspaper. The sea is sparkling blue, warm and welcoming. A little away from the backpacker enclave is Nungwi village, a sprawl of small dusty one-room brick houses. On one side of the beach, fishermen repair nets, and children wash the massive fish caught in those nets, four feet long and looking like they're made of burnished steel, in the village tap. Further down the beach, shipbuilders make dhows: sailing vessels whose design and construction have changed little in the last thousand years. Forty feet long, made of wood cut, adzed, joined, and hammered together by hand, these oceangoing ships are amazingly solid. A single sail hangs from a crossbar, raised up the mainmast by a pulley; ropes connected to the corners of the sail control its setting. 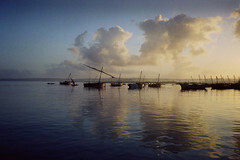 Dhows can and do still travel all the way up and down the East African coast. Some go as far as Dubai. The dive trip I joined set out in a dhow, although, conceding the existence of the 21st century, it was powered by a Yamaha outboard motor rather than a sail. It wasn't the greatest dive trip in history. On the first dive, my neighbour mistimed and mis-aimed his backwards roll, and I bashed my head bloody against his scuba tank. Either both of my tanks were filled only three-quarters full, or the air gauge was faulty (the latter being far more likely, but you don't want to find out the hard way). The sinus cavities between my eyes ached painfully through both dives, and I came up both times with a bloody nose to go with my dented cranium, a worrying development. We were promised turtles on the second dive, but saw none, and the blood billowing from my scalp failed to attract any sharks. And the ocean was much rougher than is apparently usual, meaning that visibility was silted down to maybe 15m, the journey to and from the atoll took a solid two hours each way, and on the way back, as we rolled up and down twenty-foot swells, half the girls who came along to snorkel wound up clutching the gunwales and feeding the fish. Despite the comedy of errors, it was fun. The atoll was a picture-perfect island of white sand and turquoise water studded with coral reefs. Dolphins frolicked past us as we approached the first dive site. Huge schools of colourful fish scudded around us, and on the second dive, we passed over an amazing formation of plate coral, like nothing I've ever seen before. My dive buddy was a Danish sport fisherman; also along were a South African divemaster who looked like a lot like the blond bad guy in Die Hard, and another South African who'd given up sea captaincy to drive Jo'burg-to-Nairobi overland trucks. I have a long angry political post to make about aid and Lords of Poverty and the trouble with Africa, but I think I'll hold fire for a little while. This here is a good place to just sit back, watch the sunset, and let your troubles wash away. 1There are massive numbers of Italians here, even more than in Egypt. You never, ever, see them anywhere else in the world. And if anyone knows where the Spanish travel, if they do, let me know - I didn't even find any in South America, where I expected them most.